Bukit Bintang and famous food street; Jalan Alor. Excellent location to explore KL, Just Walking distance to everything including train stations and bus terminal enabling you to avoid the city-centre traffic as you navigate your way around KL. Quiet and relaxed place to stay in KL and yet close to main shopping malls like 'Berjaya Times Sqaure, Pavalion Mall, Sangi Wang Plaza, BB plaza'; Most famous IT mall; 'Low yat Plaza'; Most famous food street of bukit bintang; 'Jalan Alor'; and also Close to very doorstep of KLs' buzzing night life. 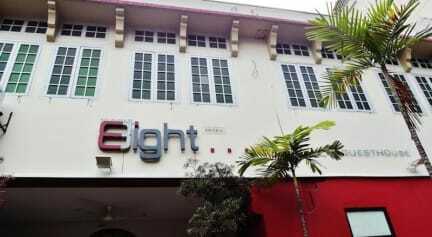 Number Eight guest house is a cool Bed&Breakfast place for the global backpackers. As a backpacker you couldn't wish for a more centralised location. Bukit Bintang's Monorail Station is only 7-8 min walk away, which links directly to and from Kuala Lumpur Sentral Station. At KL Sentral, there is a high-speed rail link to the Kuala Lumpur International Airport as well as a normal rail link to and from Singapore, Bangkok and several major Malaysian towns. Also Pudu Raya bus terminal having inner city and inter city connections, is only 12-15min walk away. Taxis too are just a hand wave away any time of the day and night. All other basic ameneties like Money changer, bakery, banks (ATM),Tourist information Center, 24-hrs convenience stores, supermarkets, pharmacies, 24-hrs McDonald, Burger King and KFC and are only few mintues walk away from our guest house. We have Free WiFi all around the guest house and free use of desktop computers for guests ensuring them to stay connected at all times. Our large and comfortable outside open air sitting area invites you to chill out and relax with your friends after a hard day of trekking the city. At number eight you can not only enjoy Satellite TV at our lobby area but also can entertain yourself or freinds with our newest addition of 'Apple TV'. Through Apple TV guests can share music, vidoes, movies and everything they have on their Ipods and Ipads on our 51' HD LED TV. They can also enjoy their time by watching Youtube videos too. 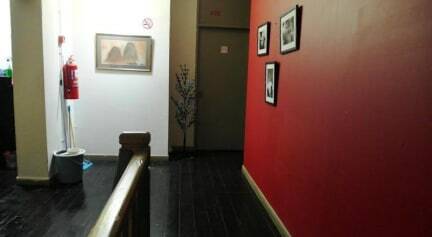 Spread over two floors, Number Eight Guest House is KL's backpackers haven which offers excellent facilities and friendly services. Choose from our Basic,Standard and Deluxe categories; Single, Double, Twin, or 4 persons dormitory accommodations; ensuite or shared bathroom. All rooms come with air-conditioning, wifi, towel, hot showers, hair dryer and breakfast(of course!) It is possible to use our kitchen facilities at all times. Guest can also make their stay more comfortable by using our laundry services at a nominal cost. Our friendly staff will try to provide you various tips and a helping hand about your touring needs, whenever you need it. We will try to make sure that you have great time exploring Malaysia. All this makes our guest house an ideal destination for not only tourists, but for business travelers and long-term visitors too.